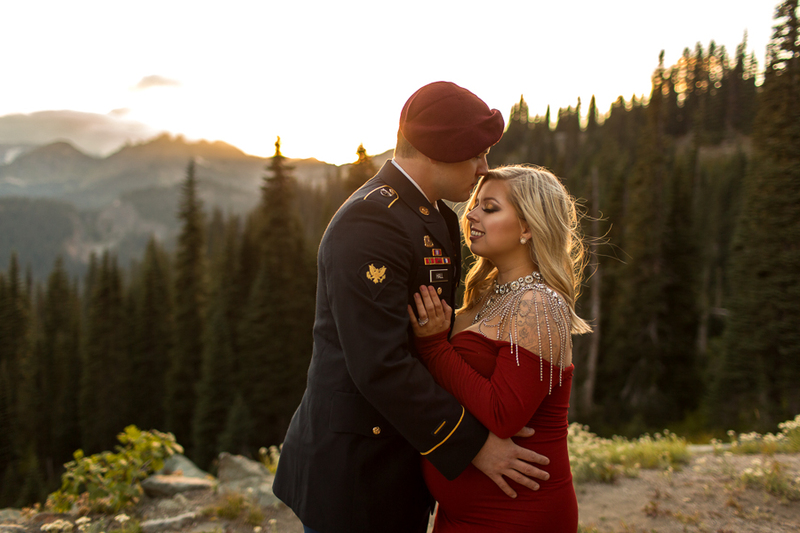 Tipsoo lake is one of my top three locations to do sessions at. It is a special place because of the breath taking views, golden glow lighting, pristine lake and unreal mountain views. What makes it even more special is how often it is open throughout the year. This year it opened on June 11 2018. It was freezing cold and snow on the ground until the first week in July. It wasn’t until mid July that the flowers started to pop up and it was warm enough for those beautiful golden sunset sessions. 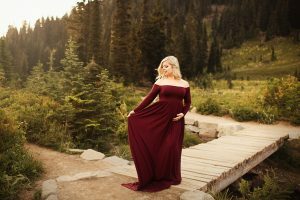 This late August session with the beautiful Madison was one of the most moody and romantic sessions of the year. 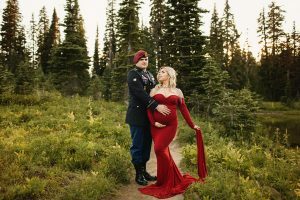 I absolutely loved her dress choices with the added details to glam up the red Emerlie gown from Sew Trendy. It was a perfect pairing with her husbands uniform. They both looked so regal and elegant. 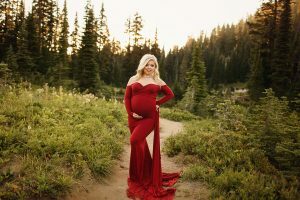 Making each session a little special to match my clients unique personality is the best part of being a Seattle maternity photographer. Madison chose 4 of my favorite gowns including a new one from Sew Trendy. The evergreen Colbie is such a beautiful soft green that popped perfectly with her blonde hair. 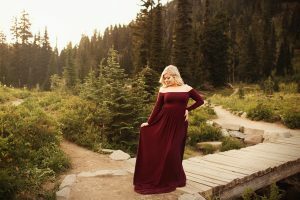 Her second choice of the burgundy Miriam gown from Sew Trendy was a perfect look for fall. After a long summer it was so refreshing to change up the bright and airy looks for deep rich tones. After soaking up all the beautiful lush greenery of summer mixed with pops of wildflowers, I’m anxiously awaiting the color change of leaves to autumn hues. 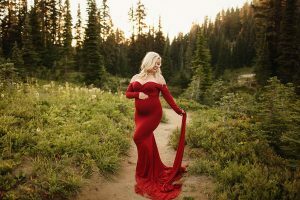 The biggest blessing as a Seattle maternity photographer is getting to experience the best of each season. Trying to capture it for each session along with the beautiful scenery is so magical. I’m so happy to have captured the magic of summer in this session. That perfect sunset with the Mt Rainier backdrop is the greatest part of summer. 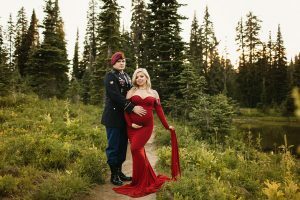 I hope you can enjoy the beauty o f this session and really a showcase of these gorgeous Sew Trendy gowns. 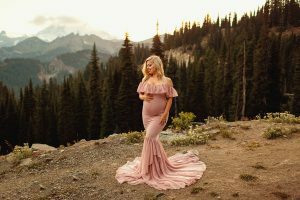 I’m obsessed with the beauty of these gowns and how they capture and transform all of my clients into celebrating the beauty of their pregnancy. Those are some stunning outfits. And what a gorgeous location. Your work is beautiful.